The Video Microscope Kit contains everything needed to estimate bull sperm motility. The Video Microscope incorporates high quality Nikon® phase contrast optics and an integrated precision heated stage. The magnification of the Video Microscope is equivalent to the field of view of a conventional 200X microscope. The Microscope is sealed in an aluminum case with a detachable lid and handle, allowing for easy transport. 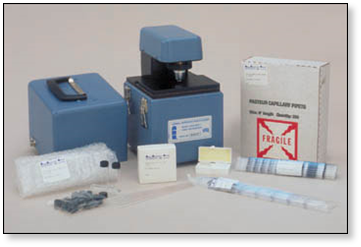 The Video Microscope Kit also includes the typical disposable glassware used for determining sperm motility. A 9" Monochrome Monitor is available separately. The Video Microscope may be set up using several different display options, such as direct connection to a monitor, VCR, or television (some TV's may require external RF modulator). When used with a VCR, permanent records of the sperm motion may be recorded for future reference. For foreign purchases, a 230V PAL format model is available. New: Nikon "Bright Medium" optics provides superior dark field image, and is ideal for motility estimation. Sperm are illuminated on a dark background for an easier view of their motion.